The average 30-year fixed rate loan has dropped below the 4% benchmark, according to Bankrate.com. Buyers can now expect to lock in for 3.94%, down 5 basis points from last week. 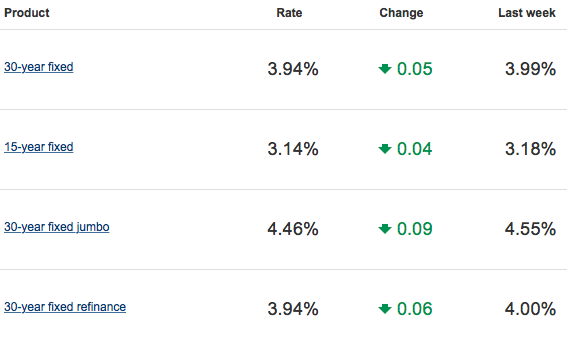 Just one month ago, the average rate was 4.16%. This decrease can save the average homebuyer hundreds of dollars per year. The nation’s average 15-year fixed rate mortgage also decreased 4 basis points to 3.14%. Most of these rates include points, which are an upfront fee that buyers can purchase at settlement to pay down their interest rate. Curious about whether or not it makes sense for you to buy points? Be sure to ask your lender about your specific situation and what they recommend.